Uranium is a chemical element wi seembol U an atomic nummer 92. It is a sillery-white metal in the actinide series o the periodic table. A uranium atom haes 92 protons an 92 electrons, o that 6 are valence electrons. Uranium is waikly radioactive acause aw isotopes o uranium are unstable, wi hauf-lives varyin atween 159,200 years an 4.5 billion years. The maist common isotopes in naitural uranium are uranium-238 (that haes 146 neutrons an accoonts for ower 99%) an uranium-235 (that haes 143 neutrons). Uranium haes the heichest atomic wecht o the primordially occurrin elements. Its density is aboot 70% heicher than that o leid, an slichtly lawer than that o gowd or tungsten. It occurs naiturally in law concentrations o a few pairts per million in syle, rock an watter, an is commercially extractit frae uranium-beirin minerals sic as uraninite. 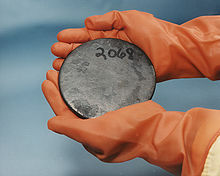 In naitur, uranium is foond as uranium-238 (99.2739–99.2752%), uranium-235 (0.7198–0.7202%), an a verra smaw amoont o uranium-234 (0.0050–0.0059%). Uranium decays slawly bi emittin an alpha pairticle. The hauf-life o uranium-238 is aboot 4.47 billion years an that o uranium-235 is 704 million years, makkin them uisefu in datin the age o the Yird. Mony contemporary uises o uranium exploit its unique nuclear properties. Uranium-235 is the anly naiturally occurrin fissile isotope, that maks it widely uised in nuclear pouer plants an nuclear wappens. Houiver, acause o the teenie amoonts foond in naitur, uranium needs tae unnergae enrichment sae that eneuch uranium-235 is present. Uranium-238 is fissionable bi fest neutrons, an is fertile, meanin it can be transmutit tae fissile plutonium-239 in a nuclear reactor. Anither fissile isotope, uranium-233, can be produced frae naitural thorium an is an aa important in nuclear technology. Uranium-238 haes a smaw probability for spontaneous fission or even induced fission wi fest neutrons; uranium-235 an tae a lesser degree uranium-233 hae a muckle heicher fission cross-section for slaw neutrons. In sufficient concentration, thir isotopes mainteen a susteened nuclear cheen reaction. This generates the heat in nuclear pouer reactors, an produces the fissile material for nuclear wappens. Depletit uranium (238U) is uised in kinetic energy penetrators an airmour platin. Uranium is uised as a colourant in uranium gless, producin leemon yellae tae green colors. Uranium gless fluoresces green in ultraviolet licht. It wis an aa uised for tintin an shadin in early photografie. The 1789 diskivery o uranium in the meeneral pitchblende is creditit tae Martin Heinrich Klaproth, that named the new element efter the planet Uranus. Eugène-Melchior Péligot wis the first person tae isolate the metal an its radioactive properties war diskivert in 1896 bi Henri Becquerel. Resairch bi Otto Hahn, Lise Meitner, Enrico Fermi an ithers, sic as J. Robert Oppenheimer stairtin in 1934 led tae its uise as a fuel in the nuclear pouer industry an in Little Boy, the first nuclear wappen uised in war. An ensuin airms race in the Cauld War atween the Unitit States an the Soviet Union produced tens o thoosands o nuclear wappens that uised uranium metal an uranium-derived plutonium-239. The siccarity o thae wappens an thair fissile material follaein the brakup o the Soviet Union in 1991 is an ongaein concern for public heal an saufty. See Nuclear proliferation. ↑ "WWW Table of Radioactive Isotopes". Lawrence Berkeley National Laboratory, Berkeley, US. Archived frae the oreeginal on 27 April 2007. ↑ Emsley 2001, p. 479. Wikimedia Commons haes media relatit tae Uranium. This page wis last eeditit on 25 Februar 2018, at 07:27.